Andelic, Patrick. Daniel Patrick Moynihan, The 1976 New York Senate Race, and the Struggle to Define American Liberalism The Historical Journal 57:4 (December 2014): 1111-1133. Glazer, Nathan, and Daniel P. Moynihan. Beyond the Melting Pot: The Negroes, Puerto Ricans, Jews, Italians, and Irish of New York City. 1963. Reprint. Cambridge: M.I.T. Press, 1970. ___. Why Ethnicity? Commentary 58 (October 1974): 33-39. ___, eds. Ethnicity: Theory and Experience. Cambridge: Harvard University Press, 1975. Katzmann, Robert A., ed. 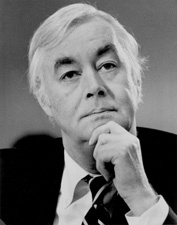 Daniel Patrick Moynihan: The Intellectual in Public Life. Washington, D.C.: The Woodrow Wilson Center Press, 1998. Moynihan, Daniel P. Came the Revolution: Argument in the Reagan Era. San Diego: Harcourt Brace Jovanovich, 1988. ___. Coping: On the Practice of Government. 1973. Reprint. New York: Vantage Books, 1975. ___. Counting Our Blessings: Reflections on the Future of America. Boston: Little, Brown & Co., 1980. ___. Family and Nation: The Godkin Lectures, Harvard University. New York: Harcourt Brace Jovanovich, 1986. ___. On the Law of Nations. Cambridge: Harvard University Press, 1990. ___. Loyalties. New York: Harcourt Brace Jovanovich, 1984. ___. Maximum Feasible Misunderstanding: Community Action in the War on Poverty. New York: Free Press, 1969. ___. Pandaemonium: Ethnicity in International Politics. New York: Oxford University Press, 1993. ___. The Politics of a Guaranteed Income: The Nixon Administration and the Family Assistance Plan. New York: Random House, 1973. ___. Secrecy: The American Experience. New Haven: Yale University Press, 1998. ___. The Social Responsibility of Business. In Business and Society and Change, pp. 7-25. New York: American Telephone & Telegraph Co., 1975. ___, with Suzanne Weaver. A Dangerous Place. Boston: Little, Brown & Co., 1978. ___, ed. On Understanding Poverty: Perspectives from the Social Sciences. New York: Basic Books, 1969. ___, ed. Toward a National Urban Policy. New York: Basic Books, 1970. Patterson, James T. Freedom Is Not Enough: The Moynihan Report and Americas Struggle over Black Family Life from LBJ to Obama. New York: Basic Books, 2010. Troy, Gil. Moynihans Moment: Americas Fight Against Zionism as Racism. New York: Oxford University Press, 2013. Weiner, Greg. American Burke: The Uncommon Liberalism of Daniel Patrick Moynihan. Lawrence, KS: University Press of Kansas, 2015. Weisman, Steven R., ed. Daniel Patrick Moynihan: A Portrait in Letters of an American Visionary. New York: PublicAffairs, 2010.